In P.E. we learn how to dance, play volleyball, tennis, swim, etc. Doing these sports can ghet you and fit and also very helthy. By doing exercise it can also keep you from future harmful things like atype of cancer. Also when you are excersising you have to eat right. Rarely my class and would be able to play dodge ball during rainy days. When we do we play in the gym we the seventh graders and 8th graders play against each other. It is so fun when we get to play dodgeball because you will always have to be looking out for the ball in case it comes to you. You have to always be ready if it comes to you which makes the game very exciting to play. I you would also like to play the game all you have to do is gather two teams, and follow these following rules: the balls have to be in the middle of the two teams, you have to throw the balls and hit a person below the waist, once you have hit the person that person has to go behind your side and have to try to catch the balls that can go to them so that they can hit you. the same is with the other side. But remember once you are on the other team's side you stay on their side. In p.e. we did a project where we had to write a two page poster about a famous sport player. 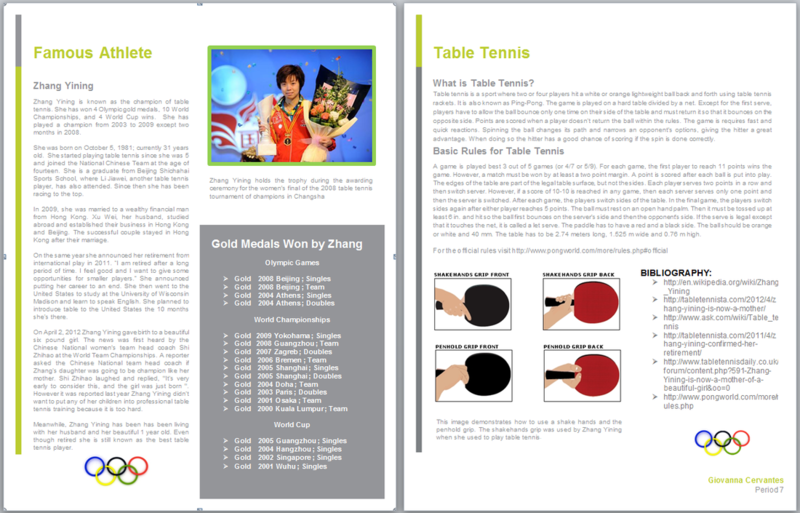 The sport I had chosen is table tennis because I didn't know very much about table tennis and was curious about what it is. This project helped me know another sport and a very famous player that then quit to give other players a chance to be a champion. I think this player and this sport has made an impression on me getting me to want to start playing the sport and so would you if you had to make a two page poster about a rocken athlete and his/her sport you would gains lots of information. In P.E. we are doing a mixture of jump rope and volleyball. One day we do volleyball and the other day we do jump rope. Some of the tricks we have been practicing with a jump rope is to have a steady beat of 90 jumps per minute 100, 110, 120, and so on. Then we had to get into groups of two and practice a routine of tricks in 20 jumps. Once we had practiced on the routine we were graded of how much jumps we did correctly in the same time. This was a very fun combinatin that got me excited and pumped my blood. 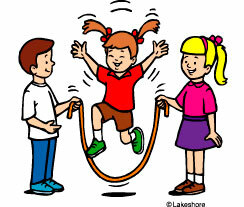 It has also improved my jumprope and volleyball skills. The sport lacrosse was very fun where we got to practice a lot to actually develop a skill with the sport and with all the practice that we did really did make me develop a very good skill at the game. You simply just have to balance my teacher says. The first things you have to know is how to balance and how to follow the directions that the teacher is telling you but here is what you have to do. You will first have to put both elbows in the inner side of your knees and lift one leg then the other. While you doing that you will have to be able to keep your elbows on the side of your knees. Next, you would have to know how to lift both legs off the ground. once you have both legs off the ground you have to lean them a little forward to have a good balance. My class and walked everyday to Edison highschool to go to there swimming pool and there we learned how to do different swimming technics that would definitely be helpful when it gets to be time for summer. I learned things like Freestyle also known as the front crawl. The way you swim that technique is by rowing your arms when you are on your belly and just row your arms while also putting your head to the side, so that you could breath demonstrated in the photo to the left. By doing swimming I was able to cool down from the sun and enjoy swimming.